Mediums are ordinary people who have through training developed their natural psychic ability to enable them to communicate with the Spirit world. There are three main types of Mediumship, mental, physical and healing. The reason for so many forms of mediumship is because our friends in the spirit world will use whatever means they can to get through and help us to understand the truth of everlasting life. 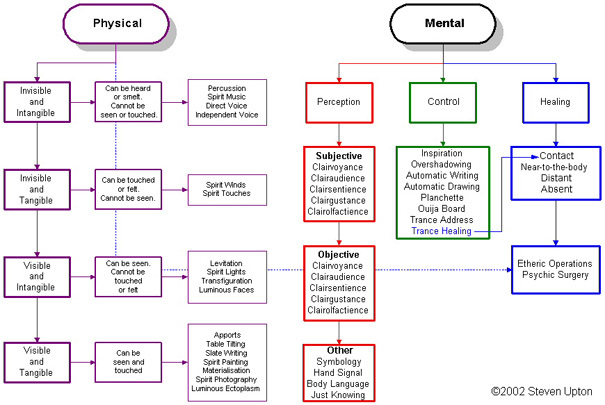 Mental mediumship is by far the most common and falls into two categories, perception and control. First perception, in this the spirit communicator works through the medium’s mind and he or she is able to see, hear or sense, pictures, sounds or feelings. They will perceive them either subjectively or objectively. In the controlled state the medium will go into trance, this will enable the Spirit control to speak through the medium or to do automatic writing. Physical mediumship is now quite rare, possibly because it takes many years to develop. This is a more direct form of mediumship as everyone present will witness the same phenomena. Spirits can speak directly with their own voice or even materialise for all to see, objects can also be levitated and moved around the room with no visible means of support. Among the great forces of Spiritualism is healing the sick either by personal contact, “the laying on of hands”, or through absent healing, in which patients are treated often at great distances away, by the sending out of healing thoughts and prayers. Many incurable diseases have been successfully treated. However no healer can guarantee a cure, but at least he can alleviate suffering, ease a passing, and possibly effect a complete cure. Spiritualist healing is not faith healing. If you think about it, babies or our pets cannot have faith, yet they can all benefit from Spiritualist healing. The following flowchart will help you to understand how the above mentioned phenomena operates in relationship to each other.